Back to School--and Cub Scouts! As schools get ready to open for the new year, we would like to send out a special WELCOME to our new Scouts, and WELCOME BACK to our returning Scouts! We are so excited for all the awesome and super-fun things that the 2014-2015 year has in store for us! For new Scouts and their families, as well as those who are checking out our Pack and considering joining us, we would like to cordially invite you to our annual kick-off Skating Party, at Great Day Skate Place in Bentonville (click here for a map). This will be on Monday, August 18th at 6:00PM. We'll have registration forms and leaders on hand to answer any questions you might have, and the kids will have fun skating and playing games! Our den meetings will begin the following Monday, August 25th at 6:30PM at Elm Tree Elementary School. New or prospective Scouts and families are invited to visit any of our events, ask questions, or register to join our Pack! 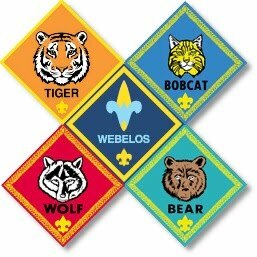 We also invite you to browse this website--you will find tons of information about Cub Scouts and our Pack--and if you have any questions, feel free to use our contact form (click here!). We respond in a timely manner to all inquiries! Thank you for visiting our website, and we hope that you will join us for a fun-filled, exciting year in Cub Scouts!